Once the big snow was over, I expected the sun to come out and stay out for a while. 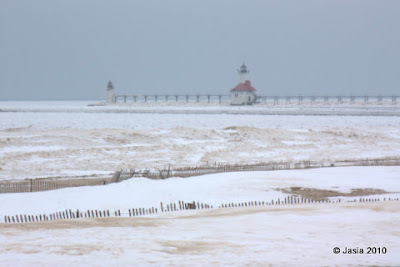 I was waiting for an opportunity to get some pictures of the sun glistening off the snow and ice on Lake Michigan with blue skies and the deep marine blue lake water to set off the bright white lighthouses. I wanted that picture to hang above the fireplace in the condo. So I waited. We came over the weekend of January 9/10 but I didn't bother to take any pictures since it was still grey and gloomy. I didn't bother to take pictures the weekend of January 23/24 because it was still cloudy. Isn't it lovely?! Just look at that lighthouse reflection on the St. Joseph River. That's what I'm talkin' about! Beautiful! I sure hope February has more sunshine! St. Joe is my home and I LOVE it! I miss it so when I'm away! Wonderful post! My fiance' and I just came back from a long weekend in St. Joseph. It was absolutely stunning there and we fell instantly in love. We've thrown around the dream of moving there permanently, but neither one of us are sure about the harsh winters. What you have helped me to see is that it's all in the perspective. Snow can be (and is!) very beautiful!